Some of the formats tested in the opening weekend included the Designer’s Conversations, which brought into dialogue several biennial participants, giving them the opportunity to expand on their project and explore convergences with the work of other designers; and the Spaces of Exception roundtables, which explored the ways in which contemporary schools, institutions and publications can push their disciplinary boundaries and becomes spaces of exception in themselves. 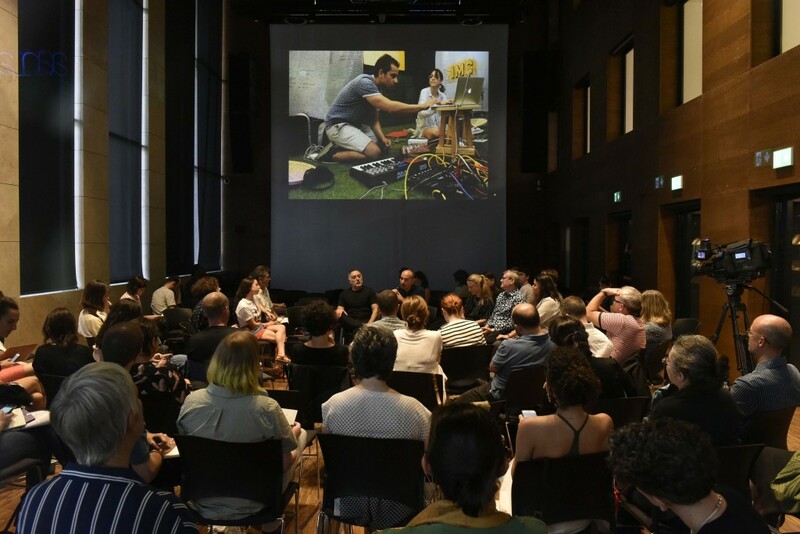 Around the venues, a number of on-going projects took place, whether in a fixed location, moving through Beyoğlu, or spontaneously convening in different places. DUE magazine’s DUE BAR, for example, took over Şimdi Cafe for a marathon of conversations, interviews and drinks with biennial participants and those who attended. Radioee and PUB.RADIO conducted two 12-hour-long live radio broadcasts during 21 and 22 September, which are available online here. And Dpr.barcelona and Open Raumlabor University hosted several instances of the Parasitic Reading Room, a series of reading sessions in unexpected places. The occasion also saw the launch of two publications, DAE’s Questioning Design: The Masters Programmes at Design Academy Eindhoven and Z33’s Studio Time (Future Reader) book. The opening weekend also featured the Urgent Pedagogies Symposium, organized by IASPIS, which brought together professional educators and pedagogical practitioners from the fields of design and architecture to present on-going educational practice, discuss on certain cases and focus on the question of methodologies and means of pedagogies. Simultaneously, Alexandra Midal also presented a new iteration of her visual and experimental project Abecedarium. Exploring the relation between education, film and design, the format discussed iconic and unknown cinematic works, screened projects, and enacted performances in short, dynamic vignettes. The opening days were complemented by a variety of performative projects, such as Legrand Jäger’s Facial Yoga classes, the activations of Judith Seng’s Acting Things VII: School of Fluid Measures, Taeyoon Choi’s Poetic Computation: Archive workshop and performance, and the overarching presence of AATB’s EYESS ISSTANBUL video screen atop The Marmara Pera. A vibrant public programme of workshops and lectures had its official start, with Carlos Monléon’s FEEDS workshop and Bakudapan’s Living Leftovers, among others. The biennial’s engaging, multi-format public program continues through 4 November – all are invited to take part!